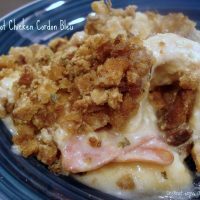 Crockpot Chicken Cordon Bleu - Dessert Now, Dinner Later! Super simple & pretty much effortless, this dish is a quick fix that you can start in the morning & come home to ready to eat. The flavors are nice & you can’t get much simpler than this! Nice alternative to the real dish. FYI: You might want to use a bigger slow cooker. Mine is a 4QT & barely fit four chicken breasts (actually used two large breasts cut in half), so you can tell by the picture that the chicken was squished a little bit. I also made some plain white rice to use with the sauce because it makes a lot of sauce, but it is so simple & tastes good, so I will be making it again. Coat the inside of your slow cooker with pan spray. Mix condensed cream of chicken soup with milk. Pour enough soup mixture in crock pot to cover the bottom. 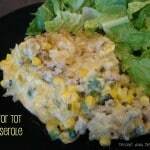 Place chicken breasts on top of soup. Layer ham & swiss slices over chicken. Pour remaining sauce over the top. Sprinkle everything with stuffing. *I’ve made this twice. 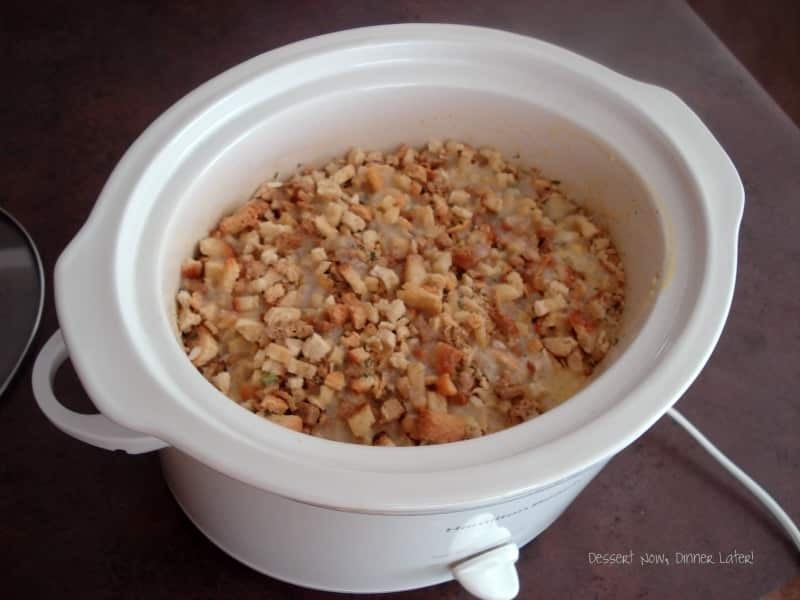 The recipe I followed had you pour 1/4 cup butter over the stuffing, but it just made the stuffing kind of soggy in the crock pot; obviously it’s not going to brown & crisp up because it was cooked in a slow cooker, but I wanted to try it anyway. 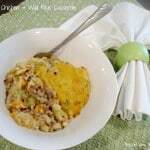 I would suggest leaving the stuffing dry to soak up a little of the soup mixture underneath, but remain dry & crisp on the top. If you want the stuffing to crisp with the butter go ahead & cook it in the oven: 325*F for 2 hours should be fine (I did mine for close to 4 hours & it was overcooked & slightly dry, so don’t go that long.) The stuffing is crispy & nice from the oven. This looks really good! I’m always looking for new crockpot recipes. They’re great for those karate days when we get home and it’s time to eat. Pinned! Thanks for sharing at Terrific Tuesday. This looks so good! 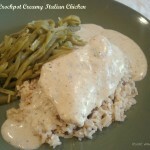 Thanks for linking up this week to Things That Make You Say Mmmmm! 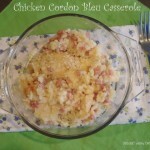 This looks really good, I love how it is made in a crockpot so it makes for an easy dinner. Thanks for sharing at Showcase Your Talent Thursday! 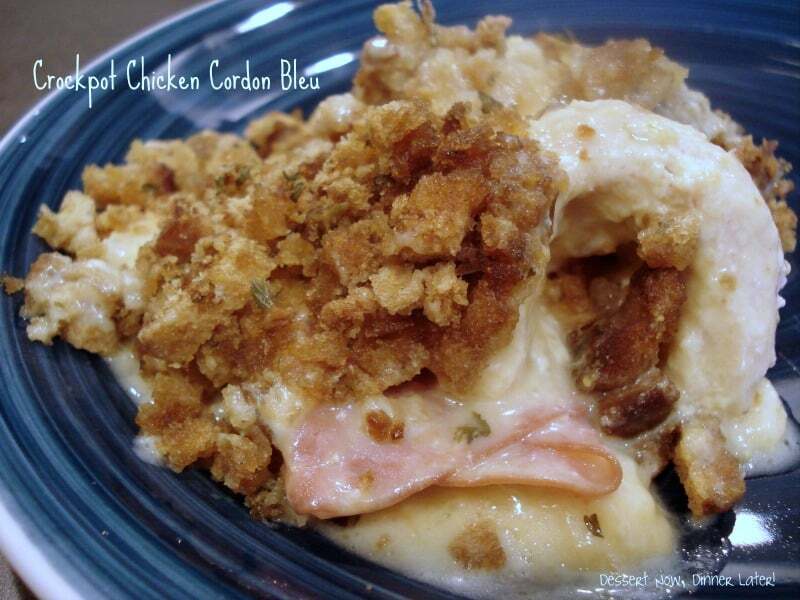 Did you use Frozen chicken breast? I use fresh, but you could use frozen. Adjust the cook time until the internal temperature reaches 165 degrees Fahrenheit.